in a single definitive text. 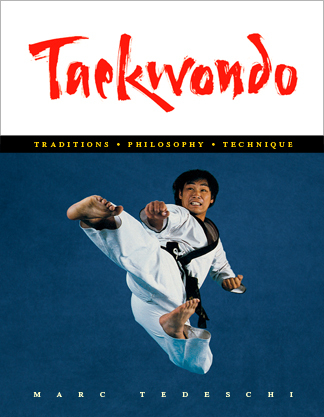 This ground-breaking text is the first to offer Taekwondo in its totality, documenting the traditions, philosophy, and techniques of the world’s most widely practiced martial art. In more than 8600 photographs spanning 896 pages, renowned Taekwondo masters and elite competitors demonstrate over 700 core Taekwondo techniques, including stances, footwork, hand strikes, elbow strikes, standing kicks, jump kicks, ground kicks, avoiding and blocking skills, step and self-defense sparring, Olympic-Style sparring, breaking techniques, and solo forms and patterns. Techniques are named in both English and Korean throughout. Highly detailed introductory chapters provide an authoritative overview of Taekwondo’s history, philosophy, current structure, and contemporary issues, and thoroughly review breathing and meditation, warmups and flexibility exercises, and vital targets. To address the highly specialized and constantly evolving needs of sport competitors, in-depth chapters on Olympic-Style sparring cover basic concepts, current trends, core techniques, tactics and strategies, terminology, competition rules, referee signals, and more than 90 core attacking and counterattacking techniques used by world-class competitors. For forms enthusiasts, 250-plus pages provide a comprehensive overview of 49 forms and patterns embraced by major federations, such as the WTF and ITF. Inclusive of virtually all Taekwondo styles, this unprecedented work integrates traditional and modern approaches, sport and self-defense, in a single text. Written and designed by the author of the 1136-page Hapkido—widely acclaimed the most comprehensive book ever written on a single martial art—this indispensable work is the definitive text on Taekwondo, and destined to become a classic of martial arts literature. Part 1 is an overview of history, philosophy, personalities, and technique. Part 2 is an overview of the basic technical elements that compose Taekwondo. More than 380 fundamental skills are documented, including stances, footwork, arm strikes, kicks, and blocks. Part 3 shows how the basic technical skills outlined in Part 2 are used for practical self-defense. More than 100 typical techniques are shown in detail. Part 4 provides a comprehensive overview of the principles, current trends, and techniques that define Olympic-Style sport competition. More than 100 typical techniques are shown. Part 5 is an overview of principles and skills used in breaking techniques. Part 6 is a comprehensive overview of 49 major forms and patterns used by different Taekwondo styles. Reference material is located in appendices at the back of the book and includes promotion requirements, Korean terminology, a cross-index of technique names as used by major styles (in English and Korean), a reading list, and a detailed index for locating specific techniques. The book’s seven parts are summarized below. Each of these seven parts contains numerous chapters, numbered for convenience. A detailed table of contents is found by clicking on more detail, as provided below (scroll down). Really Nice Book . . .